Holy Freholy that's a bright blue drink! Early on as kids we learn a simple truth: Purple raspberry things tend to taste like raspberry and blue raspberry things tend to taste like fake-raspberry flavored sugar. This bad boy is no exception, and I do mean bad. Granted, coolattas can vary depending on how well they are made, but man, this one is painfully potent. I'm thankful it only cost me $2.13 so that I don't have to feel so guilty about wasting my money... actually, that's not true. I spent my two bucks so that you don't have to. Oh, that's got bite. It hits you as you start drinking, you keep drinking, and then as soon as you stop the aftertaste really bites you. So, welcome blue raspberry as yet ANOTHER uninspired member of the coolatta family (and I thought the grape coolatta was disappointing). I will never understand why the strawberry coolatta has real berry bits in it yet every flavor since then seems to be some sham freeze pop flavor. man this thing is awful like the one from TGI Fridays. 2011 Update: First, technically the watermelon coolatta debuted in 2009, so I'm not sure why they were treating it as new in 2010. Second, the blue raspberry has made it to 2011 but the watermelon coolatta did not. Shocking! 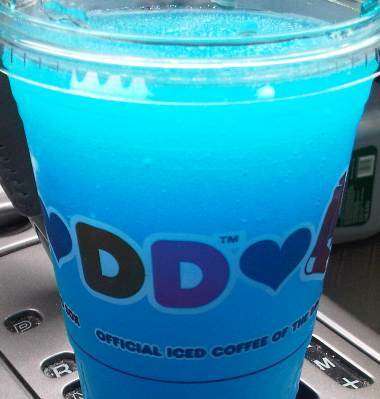 2013 Update: Spring is in full swing and the Blue Raspberry Coolatta has returned! 2014 Update: Blue Raspberry returns.... and he brought watermelon with him! My daughter tried one. I can't recommend it. She drank half and didn't mind the fake flavor, but after she was done and it had melted for an hour, what was left was similar in consistency to runny Jello. Made me wonder exactly what they put in it! My name is Nia Coufos and my favorite thing in the world is blue coolata. I've come here looking for information on the current whereabouts of said blue coolata, because I cannot seem to find info at any of my local dunkin donuts.